James Edward Mills is a freelance journalist, independent media producer and founder or The Joy Trip Project. Working in the outdoor industry since 1989 as a guide, outfitter, independent sales representative, writer and photographer, his experience includes a broad range of expeditions that include mountaineering, rock climbing, backcountry skiingm and kayaking. He is currently a contributor to several outdoor-focused print and online publications that include National Geographic Adventure, Rock & Ice and Alpinist. 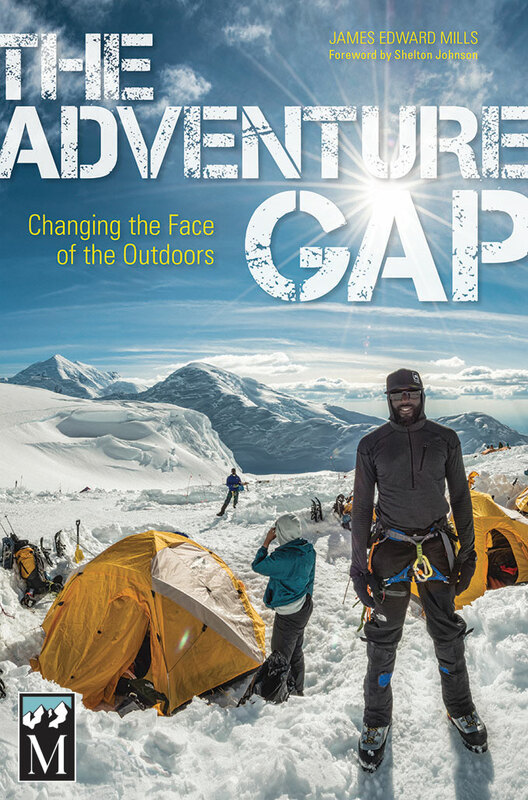 His first book, The Adventure Gap (Mountaineers Press) is available here. BA: Tell us about yourself. How would you describe your work? JM: I’m a freelance journalist specializing in creating stories about outdoor recreation, environmental conservation, acts of charitable giving and practices of sustainable living. I also have a direct interest in issues of diversity and environmental justice. So what was the spark that got you in the outdoors in the first place? JM: When I was 9-years old my brother and I joined a Boy Scout Troop in Los Angeles that was heavily into backpacking and mountaineering. From then on through high school I spent at least one weekend every month camping somewhere, primarily in Southern California. When I graduated from college I took up rock climbing and then got a job doing outdoor retail at REI in Berkeley. From there I worked for the North Face in sales and started my own agency in the midwest in 1992. I’ve been here ever since. Awesome. Was there a particular instance that inspired you to start writing with a “higher purpose” in mind? JM: It was right after 9/11 when I decided I wanted to make a career change from sales into journalism. At the time I felt like no one was really doing much to tell the stories of people trying to save the world while there seemed to be plenty of those trying to destroy it or capitalize off of the suffering of others. Since I started writing professionally those are the topics that I’ve felt most drawn to and passionate about. Which leads us to your first book, The Adventure Gap. Could you tell us more about how the project came about? JM: I’d been writing about diversity in outdoor recreation for a while. I produced a documentary for an NPR program on the Buffalo Soldiers as well as several magazine stories. I was working on a piece about diversity in the National Park Service when I became acquainted with the newly appointed director of diversity and inclusion at the National Outdoor Leadership School (NOLS) Aparna Rajagopal-Durbin. I was originally interviewing her on her role in making the most prominent outdoor education institution more relevant to people of color. Expedition Denali was a game-changer! What are your hopes in how the book is received? JM: Well I hope that it will sell a million copies! But the reality is I’m concerned that it will fall on deaf ears. Our modern world is too full of people today who simply won’t understand why this was such a landmark event. Even though the team didn’t summit, it set in motion a conversation about a critical issue that each of us, regardless of race, will have to face at some point in the future – a profound lack of support for environmental protection among the majority of the US population. But because there are so many people prepared to deny that diversity in outdoor recreation is important, we’re going to face an uphill fight to create a movement toward greater inclusion. I can only hope that I succeeded in writing a compelling enough adventure story that will captivate readers’ attention long enough to make them think about the book’s primary message and overall theme. Addressing the whitewashing of adventure media is one thing, but how do we effectively continue a conversation around environmental and conservation issues within our own communities of color? You’re challenged with getting white outdoorsy people and urban-dwelling people of color to agree on something. JM: As a person of color by definition if I continue to travel, adventure and write my way through life I’m contributing to the diversity of outdoor recreation. I can also try to tell the story of people of color out there pushing the boundaries of the field and illustrate their efforts to defy notions that suggest that these are things the black and brown folks don’t do. Why do you think that lie — that black and brown folks just don’t care about nature — is so pervasive? Do you think that’s just the fault of poor representation in media or an intentional notion of white supremacist thinking? What are your plans for after the book release? JM: Sell, sell, sell! I’m coming full circle on my career, but now I’m pushing a product of my own creation. I want to write popular fiction and hopefully create compelling characters – people of color – who exemplify the best qualities of stewards dedicated to protecting and preserving the natural world. This interview originally appeared at Everywhere All The Time and is republished here with permission.